A homestead with women gathered in the garden area to brew beer in pots for the spirit of a girl killed by lightning. This seems to be the occasion witnessed by Evans-Pritchard in 1936 when relatives gathered to make sacrifice at a colwic shrine for a girl called Nyakewa, at an early stage in the afternoon before the shrine had been erected. 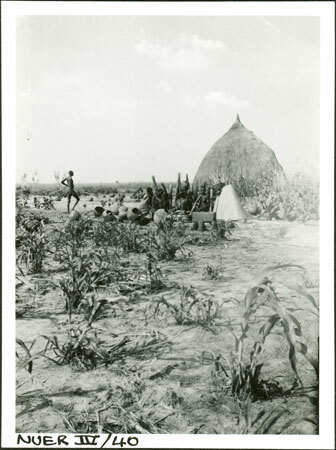 In later images a shrine (riek) consisting of an mound of earth surrounded by offerings of tobacco with a sapling of the nyuot tree planted in the centre can be seen. Nyakewa was considered to have become a colwic, a spirit taken directly by God. This specific intervention by the divine was considered so dangerous to all associated with the deceased that sacrifice is made by all relatives, and a special shrine erected with offerings. To the left is possibly the man called Lat, who was the master of ceremonies and responsible for constructing the colwic shrine. Morton, Chris. "Nuer colwic ceremony" Southern Sudan Project (in development). 03 Jan. 2006. Pitt Rivers Museum. <http://southernsudan.prm.ox.ac.uk/details/1998.355.168.2/>.